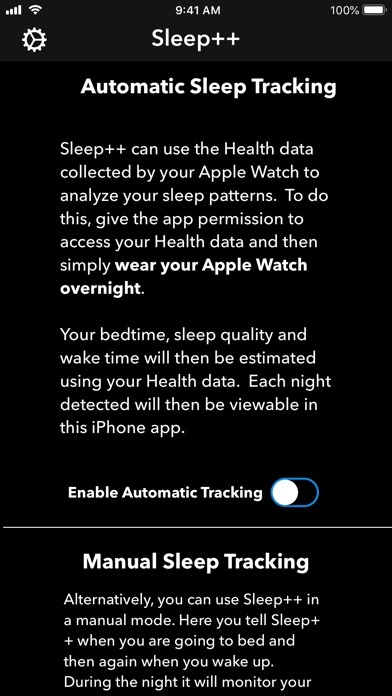 Use your Apple Watch to AUTOMATICALLY track your sleep! 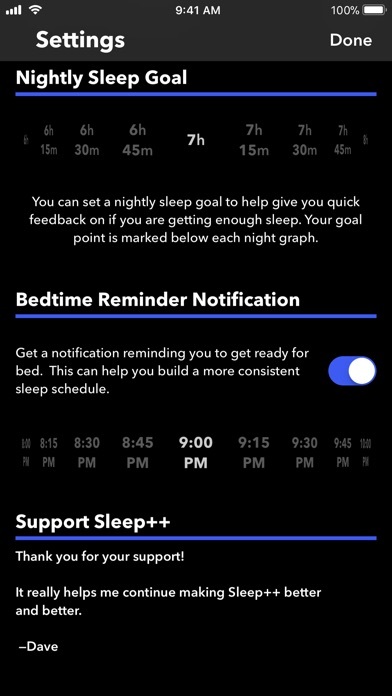 Sleep++ takes advantage of the motion and health monitoring capabilities of your Apple Watch to measure both the duration and quality of your sleep. The better you understand how well you are sleeping the more you are able to make changes in your routines to benefit your rest. My goal is to provide every Apple Watch owner with a free automatic sleep tracker that is simple and clear to understand. For each night you get a straightforward report of how long you slept and how restful you were during the night. 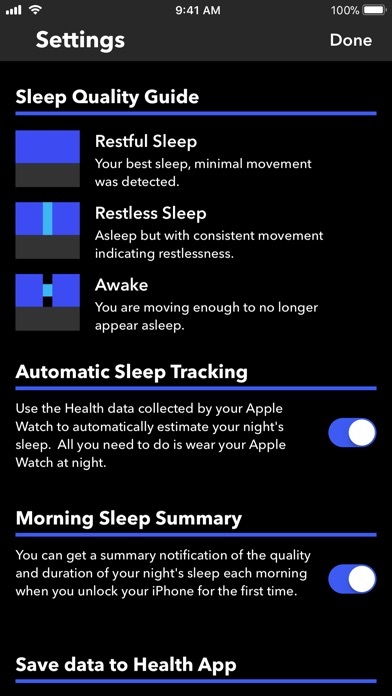 AUTOMATIC MODE: Simply wear your Apple Watch overnight and each morning Sleep++ will analyze your sleep and give you a report about how long and restfully you slept. MANUAL MODE: If you want to have more precise control over the start/end time of each night recorded you can also use manual sleep tracking. This is also useful if your nightly routine makes it difficult for Sleep++ to determine when you went to bed. 1) Wear your Apple Watch while you sleep. 2) Tell Sleep++ when you start sleeping. 3) Tell Sleep++ when you wake up. NOTES: Sleep++ integrates with the Health App providing you a safe and private way to share your activity data with Sleep++. This data is used for automatic sleep tracking. You can also optionally have Sleep++ save your Sleep Analysis into your Health database after each night. 147 hours sleeping restfully? Deleted this frustratingly useless watch app. It does a decent job of tracking sleep, although not super accurate. It will sometimes record me as sleeping before I’m even laying down for the night. Other nights it randomly doesn’t track anything at all. That data may randomly show up a week later. So I think it needs some work in those aspects. I am not sure why some nights it just doesn’t track anything with nothing changes in how I wear my Apple Watch and no settings are adjusted. Most nights it does okay. It’s easy to use on its good days. It tracks fairly well except for when I’m awake with my infant holding her in bed burping her out of 40 minutes of bing awake it registered 8 and the remaining as restless sleep. Last night app said I had over 8 hours sleep! I was tossing and turning all night and turning the TV on and off because I couldn’t get to sleep! Don’t know what it was tracking other than maybe laying in bed! I definitely didn’t get 8 hours! So I don’t understand, this app does not work at all for me. Do I move too much while I sleep it doesn’t track at all anymore. Auto logging worked for two days and then stopped. I had high hopes based on some reviews on here. Used to work with my series 4 but doesn’t anymore. Not even sure if this app is officially supported as nobody here has received support or even heard back from the app maker. Looking for an alternative. Has this app been abandoned or what? Not very detailed. Says I’m sleeping when I’m not so have to adjust every nights record. Wake up a few times during the night and it doesn’t record that unless I actually stand up, no way to add that in to subtract from total sleep. I found that the sleep tracking didn’t work. I have to get out of bed and walk to another bedroom to check on my kids several times a night. Did it even notice? Nope. I was looking forward to this app however not once has it recorded my sleeping pattern correctly. It more times than not records that I am having a good nights sleep as I toss & turn trying to get to sleep. Disappointed in the app. 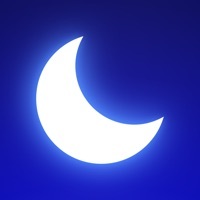 This app will track your sleep fine for four or five nights in a row, then suddenly starts skipping nights randomly. Terrible app. Seemed to work then it suddenly stopped working. No idea why. i found sleep because i missed how my fitbit would track my sleep, this app does the same but not as well. it will say i slept through points of the night when i was awake or using the bathroom. i just wish it was a bit more accurate. I tried to use this for a week and it didn’t track any sleep at all. I gave up and deleted it. This is a fake app that lies. I found this out on accident; I forgot to turn it off for a week. Sleep++ thought I slept for a week but it only said I was restless for 34 minutes. And this is when I realized that the app always says that I’m restless from 0-40 minutes every night. I have a feeling that is app lies and is programmed to show you sleep, are restless, and awake. During the week I forgot to turn it off it only says I was awake for 23 minutes!!!! But I was biking, running, and doing all kinds of awake activities! Needs an update or something, sleep/wake seems to merge even if up for a few hours, a quick app search doesn’t show via name of app. It works. Definitely detects sleep automatically and can tell when I’ve woken up. It does a poor job of recognizing restless sleep as it claims to be able to do. And the user interface for reviewing the sleep and wakeful moments is not all that friendly. It does send data to the health app, and the user interface is better there. Overall the app is functional, but lacking some features that other apps may have. But it’s free, and works. The app does not accurately track whether I’m asleep or awake. It shows I sleep the whole night through even when I get up multiple times. great app, pls consider adding auto-stop (by detecting heart rate elevation while wake-up) feature in the manual mode because it’s very easy to forget pressing stop button in the morning rush & then sleeping hours got summed as 20 some hrs when you find it by going to bed again. When this app works, it works well. Unfortunately, it kept malfunctioning. The suggestion was to delete it and then reinstall it. This would fix the problem temporarily until the app decided to go down again. I’m tired of reinstalling and losing data. I’ve deleted from my phone and will try another app. I wanted to track my sleeping patterns because I occasionally sleepwalk, and I would like a log of these events. I noticed that this app is not accurate. One night recently I got up and was wide awake and moving around the house, and I even got a end sleep notification from this app. After going back to bed and waking for the second time, I went in to see how I slept, and the app logged sleep straight through, with only 9 minutes of awake time. That’s a pretty serious discrepancy, considering I was up and moving around for three hours. There have been several instances of getting out of bed that never log as awake. This app consistently tells me that nights spent lying awake, still and staring at the ceiling, are spent deeply asleep, with only about 30 minutes of restless sleep. I would think that access to my heart rate would make it more accurate than that. It does figure out pretty reliably when I go to bed, and when I start my day. 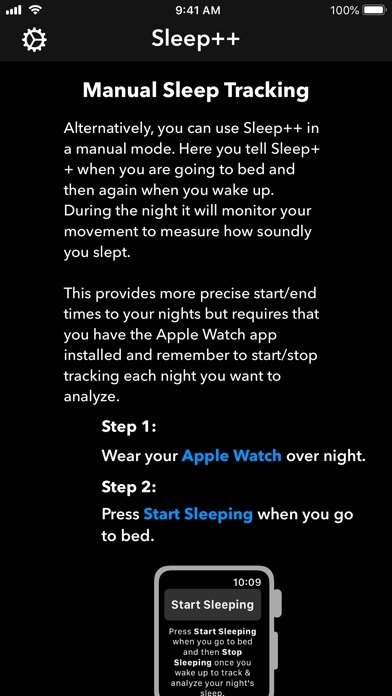 This seems like a good tracker for people who sleep well and easily, and whose goals are to spend more time doing so. This is not a good tracker for an insomniac or anyone trying to determine what helps them sleep more soundly. I have used the app on and off for over a year. The results are always within a percentage or two of 97% restful sleep. I’ve gotten up in the night, and it registers that I’m asleep. I don’t believe the app does anything. Looking at my nightly tossing and turning finally got me to go to the doctor and do a sleep study. I have sleep Apnea. Now I have a machine, I sleep MUCH longer at night. But I still toss and turn. App is now crashing 100% of the time on iOS 12.1.2. New fix coming soon? Disappointed in this app. Does not track my sleep accurately. When I wake at night & actually get out of bed, the next morning it tells me I had never been awake 😳. My Fitbit Versa is way more accurate. I have this a try but will wear my Fitbit to bed to track my sleep. It does not work every night. I wear my watch to bed every night and some mornings when I look at my watch it does not have how I slept that night. It’s happened several times. Intermittent success with automation - sometimes it works for several days and then you need to use the Manual start... frustrating! In automatic mode, this app doesn’t know sleep from awake. I have an infant that wakes up in the middle of the night. The app says I was only awake for 6 minutes. If only that were true! The truth is that I was awake for more than 30 minutes. Also, the design is ugly and boring. And it lacks any real detailed sleep analysis. 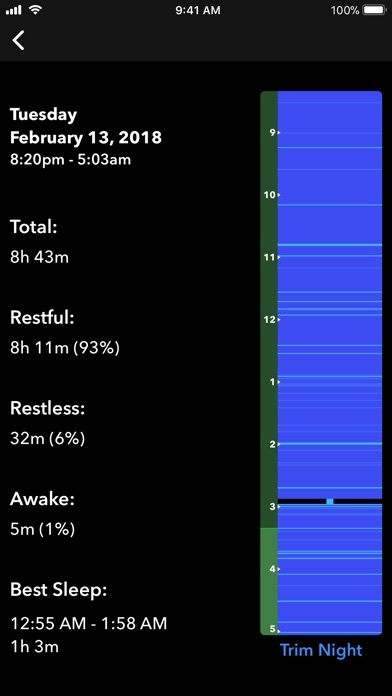 Instead of showing light, deep, and REM sleep, it just says “restful” and “restless.” This makes it truly useless as any sort of useful tool or tracker. It’s a real shame because other apps by this developer are actually nice and usable. Tracker worked for 2 nights. Now I just get a solid blue line. Somehow, this app opened and kept running for four days. I’ve been active and working every day but it reports I’ve had 104 hours of restful sleep and only 1.5 hours awake. My guess is this app just starts and stops on command and makes up any data. I don’t think it truly tracks anything. I have had a few nights where I slept very poorly and was awake for several hours and up moving around. This app did not detect any “awake” periods and primarily recorded restful sleep. 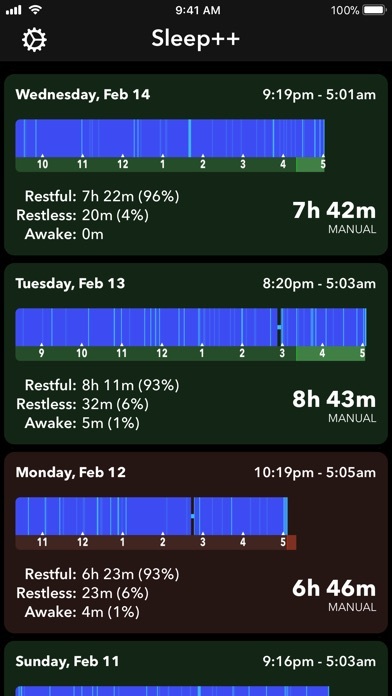 I’ve used a lot of sleep apps over the years, but this is the first that I have used with an Apple Watch (series 4). Most of them I had either had my phone on my bed or on my nightstand and were overall pretty accurate. This app was beyond inaccurate. One would think that for two hours while watching TV and even thinking, “I should move my wrist so it knows I’m awake” that I would not be considered sleeping. Oh well. There’s a million more out there. I’ll just try another. Exactly what I’ve been looking for. Pretty dang accurate too. Thanks! I have a newborn and decided to download this to see how much sleep I got. The automatic tracker said I got over 9 hours and 0 hours awake... Any parent knows that’s crazy. My fit bit caught 6 hours with 28% awake. This app does not capture your sleep quality accurately at all. I’m used to the FitBit where it uses your heart rate to analyze when you are awake and when you are asleep. This only shows you awake if you are up and moving. Chances are if you are up and moving, you know you’re awake. I want a sleep app that mirrors more like the FitBit showing my different levels of REM sleep and also how long I’m awake each night. Don’t bother with this app, it barely tells you anything.